Review by AllTheBestFights.com: 2016-09-09, fight not particularly exciting between Daniel Jacobs and Sergio Mora 2: it gets two stars. The Wba Mw champion Daniel Jacobs entered this fight with a boxing record of 31-1-0 (28 KOs=90%) and he is ranked as the No.2 middleweight in the world (currently the #1 in this division is Gennady Golovkin). He suffered his only loss when he faced Dmitry Pirog in 2010, since then he has won eleven consecutive bouts beating Peter Quillin in his last one (=Jacobs vs Quillin). His opponent, the former Wbc light-Mw champion Sergio Mora, has an official record of 28-4-2 (9 knockouts) but he is not ranked as he hasn’t fought since August 1, 2015 when he was defeated by Jacobs in their first fight (=Jacobs vs Mora I). 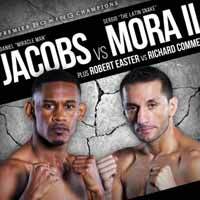 Jacobs vs Mora 2 is valid for the WBA World middleweight title. Watch the video and rate this fight!